Only 20 minutes from the airport, and close to the centre of Porto, this modern building provides high standard office space and two conference rooms that can fit up to 24 people. There is also an on-site café and a roof garden to relax in. The building also has an excellent parking area for customers and visitors, a great covered garage space and different locked storeroom areas. Clients have 24-hours-access to their offices, and are protected by CCTV. Situated at the heart of the historic city of Porto, this modern serviced office centre provides stylish work spaces on two floors of a major shopping centre. Easily accessible, and close to a fantastic range of bars, eateries and retail. At the space itself, you can benefit from 24-hour access, meeting rooms, and on-site parking. This is the perfect work space solution for companies with international clients. 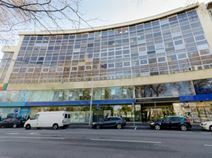 This centre is well situated in the heart of Porto's business district, with great access to numerous professional services including; spacious meeting rooms, high-speed internet, business lounge areas, reception desk and telephone answering. The office building also provides cleaning services to ensure the daily upkeep of the business environment. Public transport links are numerous and include underground and railway stations at your doorstep, as well as the international Airport being a short 5 miles away. A number of restaurants, bars, cafes and retail outlets can be found just outside the office building, meaning that there is something for everyone to enjoy during work breaks. Located in the heart of Porto, this business centre offers a range of professional and flexible office spaces with excellent services and beautifully designed spaces. Whether you are looking for a single desk or a space for your team, here you can work comfortably and efficiently. The centre also offers complimentary beverages, access to a kitchen, meeting room use and a communal chill-out area with a TV, playstation and ping-pong table. It's found in a great area with easy access to public transport links with plenty of local eateries. These office-spaces are well located in the centre of Porto's historic district and feature meeting rooms, conference facilities, copy and printing facilities and office cleaning and maintenance. A dedicated reception desk is also available to handle administrative duties including mail handling and greeting guests. The location is well connected in terms of public transport with two Railway stations being situated within walking distance. Furthermore, the Francisco Sa Carneiro Airport is a short drive away, allowing your employees to manage global relationships with ease. Surrounding the centre is a range of local amenities including; cafes, restaurants, hotels, bars and retail outlets. This modern and very stylish building consists of fully furnished meeting rooms, training rooms, waiting room and reception service, all provided with air-conditioning and telephone system. It offers exclusive virtual office services. The building is centrally located, close to important shopping malls and cinemas so you will have plenty of options and venues in which to entertain visiting clients. 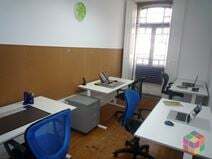 Located in a century-old building on one of Porto's oldest streets, this modern shared office space has been fully renovated and is specifically designed for entrepreneurs, professionals and SMEs. Within the centre's locality, you can find a cake shop, 'MULTI-PURPOSE OF AREOSA' auditorium, as well as an abundance of restaurants in which you can entertain and impress clients. It is highly accessible from the E1 and A1 road links. These spaces are available under flexible terms so you can choose a package that suits you! The offices come fully furnished and includes your own personal pedestal for your comfort. Access can be gained 24/7, so this space really does suit everyone’s needs. Meeting rooms are available and hold up to 5 people. There are also many monuments within the surrounding area to observe, just outside of the Museu do Tesouro da Sé do Porto which is a very short stroll away!